Come October or November, and you will find me starting to hunt for the day planner I'll use the next year. I absolutely CAN'T live without one, and I usually make a very good use of it (I'll show you how I go about it in another post so stay tuned). My planner contains everything from blog posting, to social events and more. Heck I even keep a log of my cash expenses and meal planning. Simply put, my planner is my personal bible and it has a place of honour on my desk. With all the technological advancement I haven't found anything else to be as efficient as the good old paper and ink method. With this in mind, choosing the right planner year after year is something I take seriously. Mostly because with the book being in full view at all time, I want it to look nice. It also has to be big enough for me to write down everything in it. One page per day is a must as well. Over the years, I found that Nightingale is the brand to go to in India, they have the best quality paper and a fair range of sizes and styles for their planner. This year though, I decided to add more personal touch to it. To be fair, I think I just needed an excuse to play with beads and buy those cute little metallic charms my local craft supply shop started selling...sue me! For this project, the only two things I bought were the metallic charms (the leaf and the star) and some small brass rings used for jewellery making. All the other supplies on that charms were things I already had. All in all you will need a small brass ring to tie the various strings and ribbons to, a collection of beads and charms in different sizes, some bead necklace string (the transparent nylon kind is what I used), some ribbon bits (I used some I saved from a gift wrap) and a hot glue gun (or fabric glue, but it takes more time to dry). How you go about it is really up to you. I decided to tie one of the charms to the brown ribbon and a big wooden bead at the other end. Since that length of ribbon was quite short I needed the hot glue gun to glue the bead into place. I then used a small bit of purple wire to secure the ribbon near the brass ring, a thing you can do with a thiner piece of ribbon if you have it. I then took a length of necklace thread and folded it in half and strung glass beads on each length. How many dangling strings you have on your charm depends on the size of the brass ring and what your personal taste is. I went for 4, because this seemed just right to me. 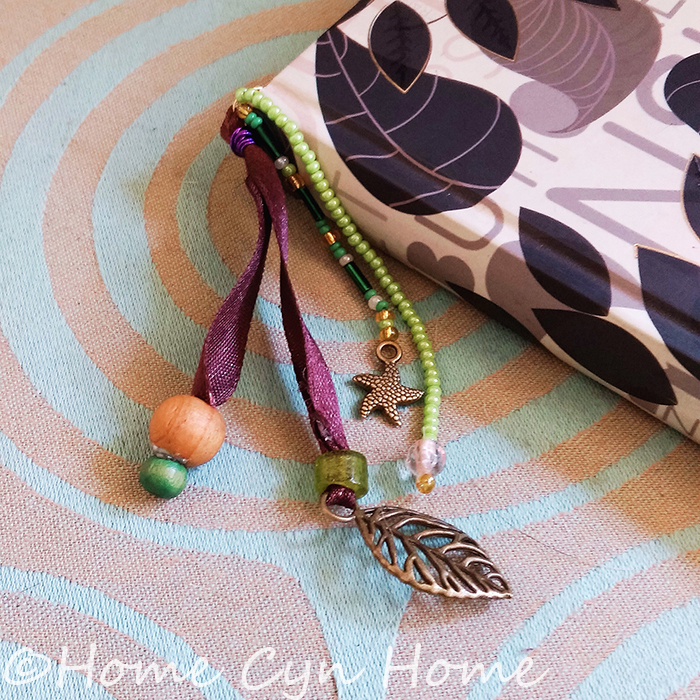 Once the charm is done, all you need to do is use the planner's bookmark ribbon. Tie the bookmark around the brass ring of the charm, as close to the base as possible and keep on using said bookmark the same old way. 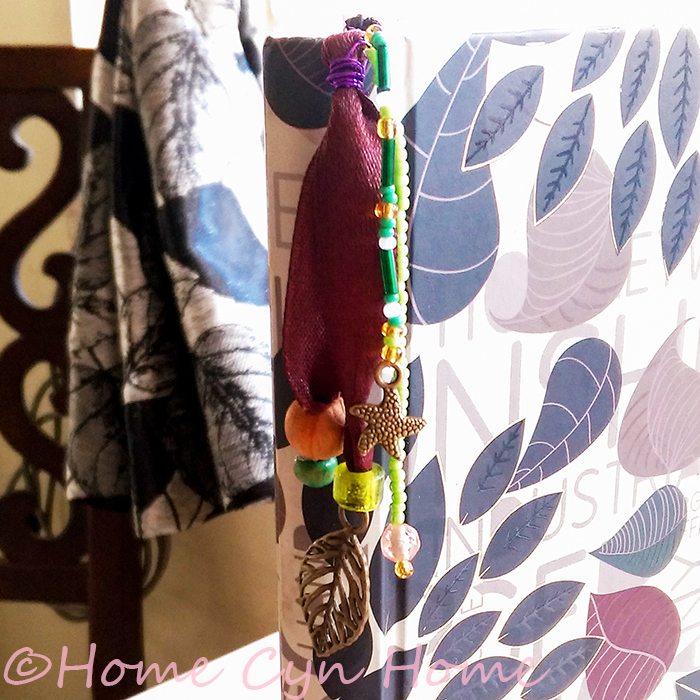 Alternatively, you can make a smaller charm and tie it at the loose end of the planner's bookmark ribbon for a different look. 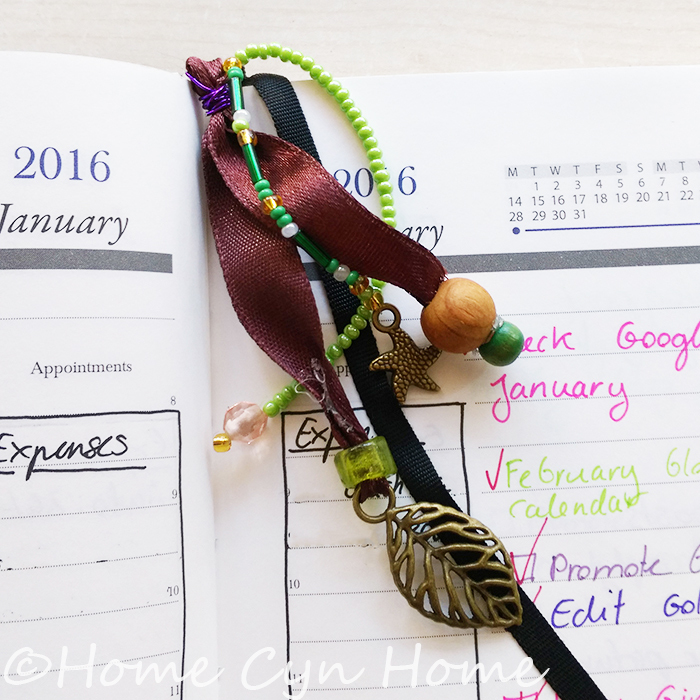 At the end of the current year, you can just cut that bookmark charm free and use it again on the next planner. Very difficult :-) For me it is near impossible to resist anything craft supplies. Our local shop owner know me so well because I end up buying stuff every week. If my daughter isn't with me he enquire about her, and if I buy only one or two items is jokingly say "Is that it?" and my reply is "You know I'll be back soon enough".